Custom screwdriver tool set with LED flashlight automobile keychain makes for one value promotional token, which offers you long term benefits against miniscule investment. It is equipped with all those items, which are required to bail you out during emergency situations. Bearing a key chain, screwdriver and light source, this keychain makes a reliable emergency tool. 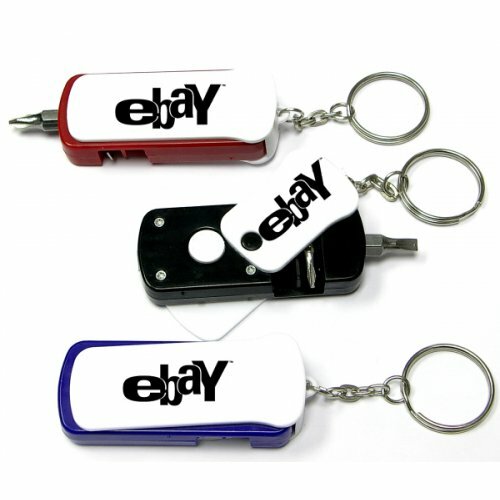 This flashlight screwdriver tool set keychain stands perfect for marketers in real estate, mechanical, engineering, construction and other related niches. An extremely perfect choice for gifting if you wish to thrive and flourish in the regions, which are prone to natural and inflicted calamities. Request a quote for knowing wholesale price savings on promotional flashlight screwdriver tool set with LED flashlight automobile keychain. Features – Screwdriver tool set offered with LED flashlight and keychain. Magnetic 2 flat and Phillips screwdriver bits. Solid ABS construction. Larger imprint area. Available colors – Blue, Green, Red and Black. Imprint Area :1" x 3/4", 2" x 3/4"